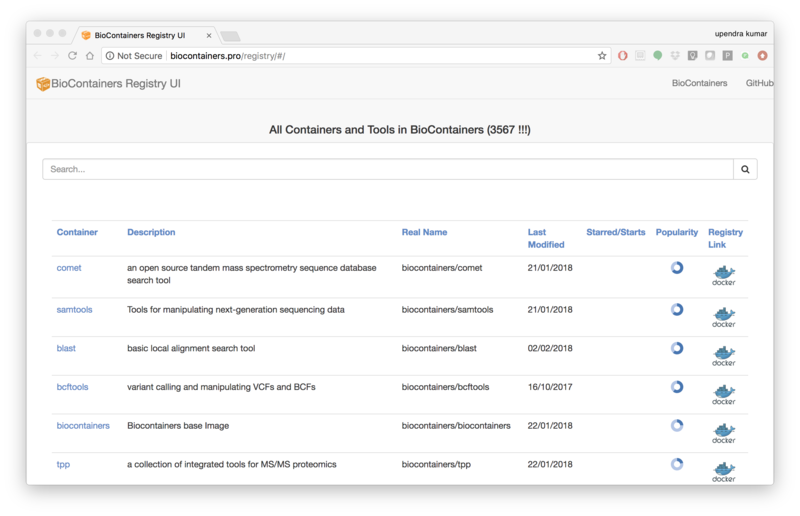 BioContainers is a community-driven project that provides the infrastructure and basic guidelines to create, manage and distribute Bioinformatics containers with special focus in Proteomics, Genomics, Transcriptomics and Metabolomics. BioContainers is based on the popular frameworks of Docker. Provide a base specification and images to easily build and deploy new bioinformatics/proteomics software including the source and examples. Provide a series of containers ready to be used by the bioinformatics community (https://github.com/BioContainers/containers). Define a set of guidelines and specifications to build a standardized container that can be used in combination with other containers and bioinformatics tools. Define a complete infrastructure to develop, deploy and test new bioinformatics containers using continuous integration suites such as Travis Continuous Integration (https://travisci. org/), Shippable (https://app.shippable.com/) or manually built solutions. Provide support and help to the bioinformatics community to deploy new containers for researchers that do not have bioinformatics support. Provide guidelines and help on how to create reproducible pipelines by defining, reusing and reporting specific container versions which will consistently produce the exact same result and always be available in the history of the container. Coordinate and integrate developers and bioinformaticians to produce best practice of documentation and software development. 1.1 - How to Request a Biocontainer? The issue should contains the name of the software, the url of the code or binary to be package and information about the software. 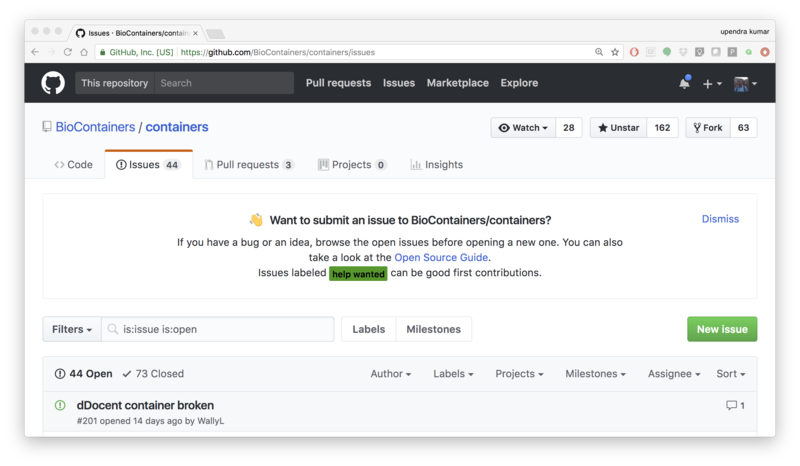 When the containers is deployed and fully functional, the issue will be closed by the developer or the contributor to BioContainers. 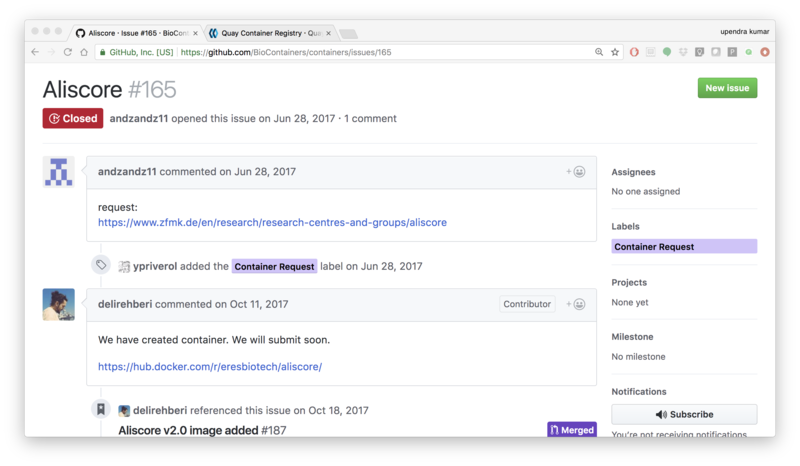 When a container is deployed and the developer closes the issue in GitHub the user received a notification that the container is ready. Reporting a problem with a container: If the user find a problem with a container an issue should be open in the container repository, the user should use the broken tag (see tags). Developers of the project will pick-up the issue and deploy a new version of the container. A message will be delivered when the containers has been fixed. Please always follow the best practices and help pages using input and output files information. LABEL description="an open source tandem mass spectrometry sequence database search tool"
1.2.1 - Run it!, Test it! Once the container is ready you should test it, try to run your program using the run command, check if all its functionalities are in order. 1.2.2 - Contribute if everything looks OK. You can contribute to the BioContainers project by sending your Dockerfile. In contrast to traditional Biocontainers, Bioconda based Biocontainers offers a very easy way to create efficient containers that are minimal in size, tested and not rely on writing a Dockerfile. The preferred way to do this is to write a conda package and submit this it the BioConda communtiy. As soon as your PR is merged and continues integration testing was successful, a container is built and publish it at quay.io. If the recipe installs custom wrapper scripts, usage notes should be added to extra -> notes in the meta.yaml. Recipe vs package A recipe is a directory containing small set of files that defines name, version, dependencies, and URL for source code. A recipe typically contains a meta.yaml file that defines these settings and a build.sh script that builds the software. A recipe is converted into a package by running “conda-build” on the recipe. A package is a bgzipped tar file (.tar.bz2) that contains the built software. Packages are uploaded to anaconda.org so that users can install them with “conda install” command. Bioconda requires the conda package manager to be installed. If you have an Anaconda Python installation, you already have it. Otherwise, the best way to install it is with the Miniconda package. Bioconda supports only 64-bit Linux and Mac OSX. The Python 3 version is recommended. After installing conda you will need to add the Bioconda channel as well as the other channels Bioconda depends on. It is important to run the following commands in this order so that the priority is set correctly. 2.1.4 - Next, create a fork of bioconda-recipes repo onto your GitHub account and then clone it locally. Create a github account if you don’t have one already. While not required, you can be added to the Bioconda by posting in Issue #1. Members of the Bioconda team can merge their own recipes once tests pass, though we ask that first-time contributions and anything out of the ordinary be reviewed by the @bioconda/core team. Even if you are a member of the Bioconda team with push access, using your own fork will allow testing of your recipes on travis-ci using your own account’s free resources without consuming resources allocated by travis-ci to the Bioconda group. This makes the tests go faster for everyone. If the tool is not available from any of the above sources, then you need to generate a Bioconda package from scratch. After creating your recipe (using one of the above methods), to make sure your recipe works, you need to test it locally. There are two options. If it’s your first recipe or the recipe is doing something non-standard, please ask @bioconda/core for a review. After the pull request, travis-ci will again do the builds to make sure everthing works. When the pull request is merged with the master branch by Bioconda team, the package will be uploaded to anaconda.org and Biocontainers will be pushed to quay.io. Once the Bioconda package is available on Anaconda and biocontainer is available on quay.io , it may be a good idea to test those in staging first, so that production jobs aren’t interrupted. 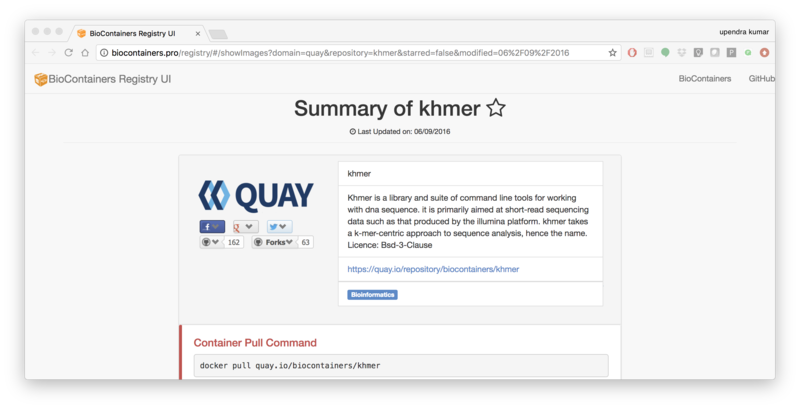 Run the tool’s Biocontainer using the image:tag name, sample parameters, and inputs given in the tool request with a docker run command. BioContainers Registry UI provides the interface to search, tag, and document a BioContainers across all the registries. Description: Description Provided by the developer of the container. Last Modified: Last date where the container has been modified. Starred/Start: If the container has been starred in any of the repos. Popularity: How many times a container has been pull from a registry. Registry Link: the registry Link.